Home » Manufacturer » Dynamic Air Inc. Dynamic Air manufactures a complete line of dense phase and dilute phase vacuum and pressure pneumatic conveying systems, vibratory equipment and components for handling a wide variety of dry bulk granular materials. 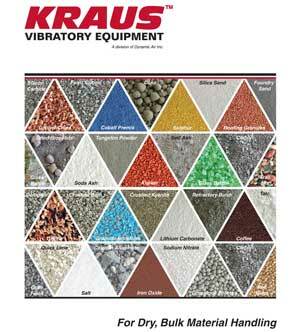 Dynamic Air offers 16 different pneumatic conveying concepts: Each system has it own unique set of operating characteristics for pressure, conveying line velocity, efficiency and performance. 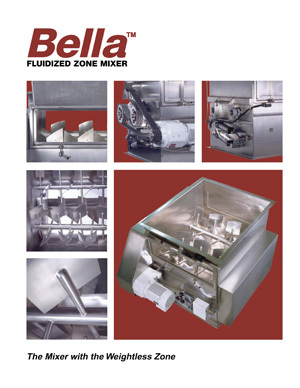 Because each and every material to be conveyed reacts differently under a given set of operating conditions, it is critical to match the system operating characteristics to the material to be conveyed in order to achieve the most desired conveying performance and to provide the best value. 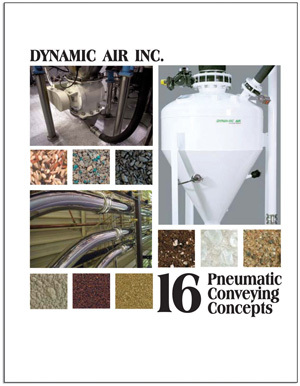 Dynamic Air's 16 different pneumatic conveying concepts have the ability to convey at almost any conveying velocity desired to suit a given material to be conveyed. Plus, our conveying capacities range from just a few hundred pounds of material per hour up to 500 tons per hour.